22 January, 1944, 1st, 3rd, and 4th Ranger Battalions spearhead the Anzio landing in Operation Shingle. This was one of the most effective and least costly of all Allied amphibious landings, but the least exploited. It was ten days after the landing before General Lucas ordered his forces to advance on Rome. 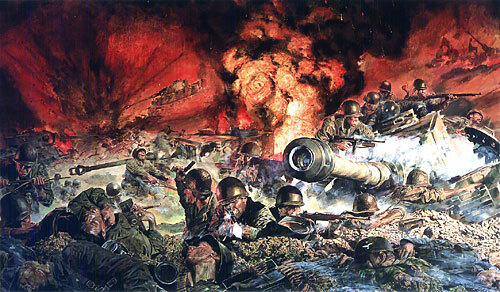 The mission of Task Force Ranger was to use their special training for a night infiltration behind German lines to set up two major blocking positions. This would relieve the pressure on the beachhead and possibly start the 30-mile drive on to Rome. 0100, on 30 January, 1st and 3rd Ranger Battalions moved out into the night hoping to reach the town of Cisterna and its vital road junction. The terrain between the departure point and Cisterna was flat farmland with little or no cover. Stealthily moving toward the objective, 1st and 3rd Battalions continued to avoid detection. Though they passed close by German positions and enemy patrols crossed in front and on both sides, the Ranger presence seemed to go unnoticed as daylight approached. Moving in the file formation, as they had used several tines successfully before, is one of the more risky behaviors of the Ranger advance. As night gave way, the Rangers could see the town of Cisterna, only five hundred yards away. The two battalions surged forward as one trying to enter the town, and find cover before the sun and the Germans found them. As night ended so did the elements of Task Force Ranger. The single enemy machine gun that once blocked 4th Ranger Division soon became a dozen. The Germans quickly counterattacked stopping them dead in their tracks, even cutting them off as Colonel Darby urged them forward towards their brother Rangers. No Rangers, Infantry of Sherman tanks would force their way up that road that day or in 100 days. 4th Ranger Battalion bled themselves white for eight hours trying to reach 1st and 3rd Ranger Battalions, but they were left on their own. As the Rangers sprinted forward with Garands, BARs and Thompson machine guns in their hands, covering the last two hundred yards; the end of a long journey seemed near and so it was. Somewhere along the last mile the Germans detected the Ranger infiltration. The unit that got to the town first was not the Ranger, but elements of the 4th Fallschirmjaeger Regiment, the elite of the German Paratroopers. A sheet of flame and steel ripped into the Rangers in mid stride causing them to collapse in a nearby farmer's open field. Going into semi-circular defensive position, which measured 300 yards by 100 yards, the Rangers returned fire. As the Rangers, lying in the open field, devoid of cover, fired, the German Paratroopers closed in on them with heavier and heavier weapons systems. The Rangers fought bravely through that night and into the day, but without heavy organic weapons, the battle was lost as soon as they were caught in the open. In just under eight hours, the battle was over. No more shooting was heard just the moaning of the the dead and dying, and the shuffling of the captured. Only six men returned to report to Colonel Darby; only six out of the 767 that began the missions.